"In 1924, the Royal Aero Club organized a Light Aircraft Competition. £3000 was offered in prizes. 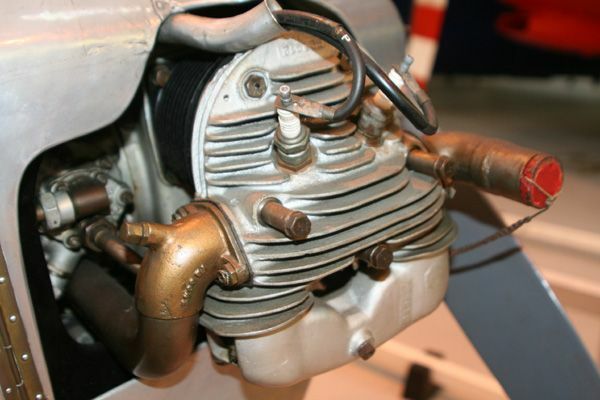 An entry was made by Hawker Aircraft, which was a design by Sydney Camm, the Cygnet. Camm had joined Hawker the previous year. Two aircraft were built (G-EBMB and G-EBJH) and were entered in the competition, held in 1924 at Lympne Aerodrome, by T. O. M. Sopwith and Fred Sigrist. The aircraft were flown by Longton and Raynham and came in 4th and 3rd places respectively. 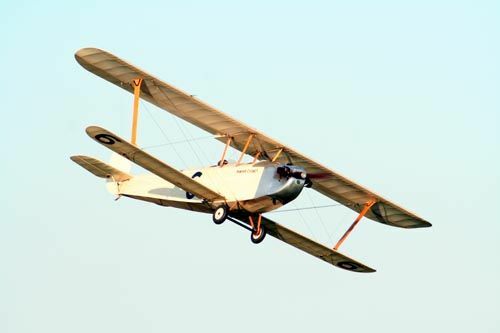 In 1925, G-EBMB was entered again in the 100 mi (161 km) International Handicap Race, this time flown by George Bulman, who won at a speed of 75.6 mph (121.7 km/h). At the same meeting, the Cygnet came 2nd in the 50 mi (80 km) Light Aeroplane Race. In 1926, both aircraft were entered in the competition piloted by Bulman and Flying Officer Ragg, taking first and second place respectively. 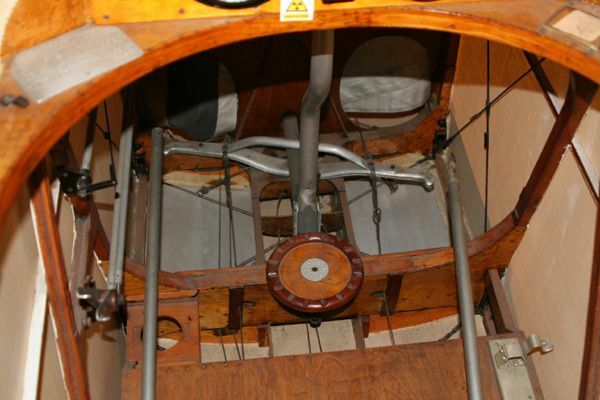 So here we have a very minimalist 2 seater bipe of around 28 feet span, so a 1/5 model should come out at 67" span. I reckon an AUW of around 8lb, with 800 watts up front should be more than adequate. 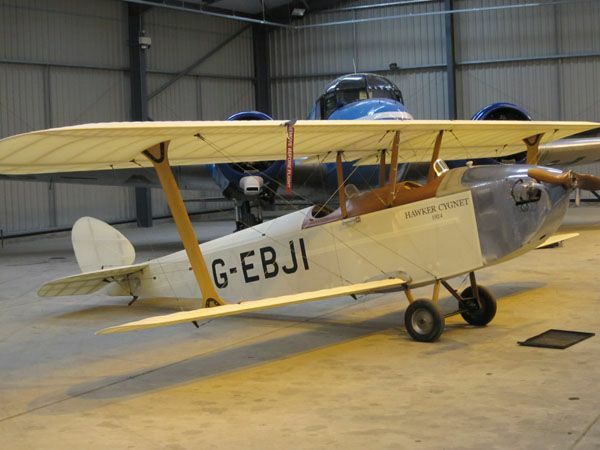 Interestingly, even though there were only 2 Cygnet built by Hawker, there are at least three in existance today! 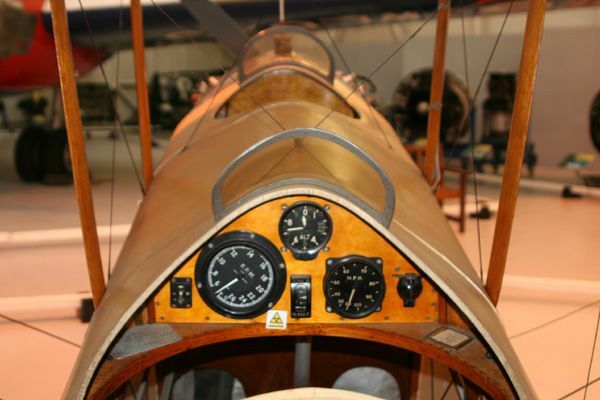 One of the originals is on static display at the Cosford Air Museum, whilst there are at least two full-scale replicas based at the Shuttleworth collection. Speaking of the Cosford Cygnet, I was able to obtain permission a couple of years ago to climb over the barriers and to get some detailed shots of the aeroplane, and I've saved these pics to a gallery on this very website! 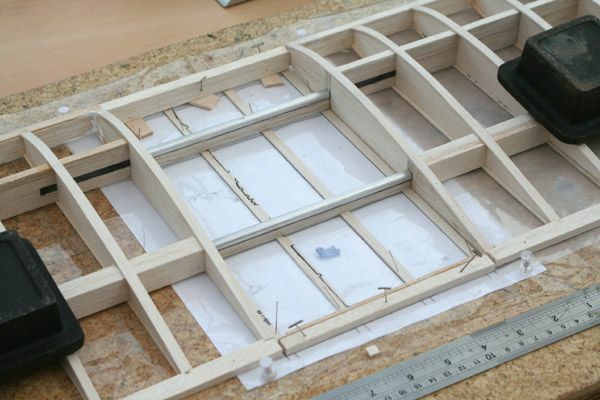 Now I'm not proposing to build a 100% scale masterpiece; rather this will be usual 'that looks about right-ish' sort of cartoon scale model, and I'll be fiddling the dimensions as I see fit, starting with the wing section which I've altered from an under-cambered nightmare to a much more friendly ClarkeY 12% for ease of construction! I've also collected a few pics of the replica Cygnets on my visits to Old Warden, so here's a couple to give a taste of the aeroplane. 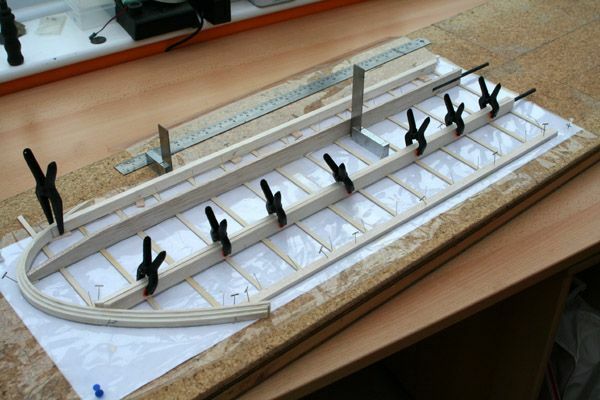 .....and today I actually started the construction of the curvy bits, ie, wing tips, tailplane and rudder. I've plumped to laminate these from pre-soaked balsa strip, wrapped around foamboard templates, and PVA'd together. 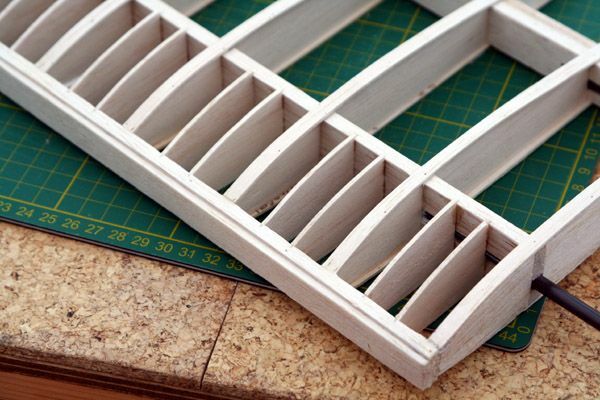 Now it might have been easier to use segmented arcs of balsa sheet for this, but as the finished model is destined to be covered in 'linen' Solartex the structure will be fairly visible beneath, and I think it'll look better this way! 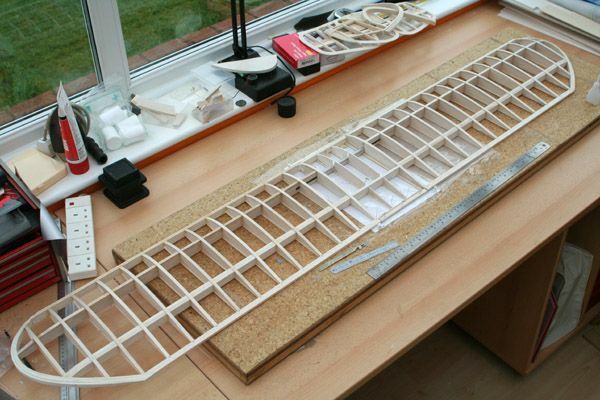 An upper wing tip, half a tailplane and the all-flying rudder. 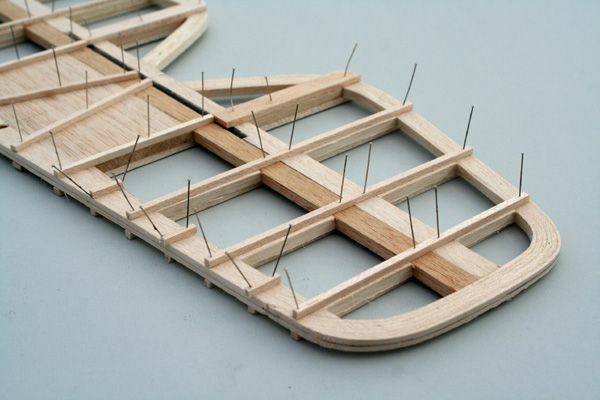 I normally like to get the wings out of the way first, but as I'm low on balsa (and the local model shop is closed until tomorrow), I've started on the rudder instead! First I draw the final plan. This is eventually submitted for publication after all the endless amendments and captions have been added. Second, and to avoid marring the Final Plan with pin-pricks and gobs of glue/blood/sweat and tears, I make a quick tracing of the part in question, and actually build on the tracing itself. A sheet of white paper under under the tracing, and a layer of plastic film on top keeps it all legible. 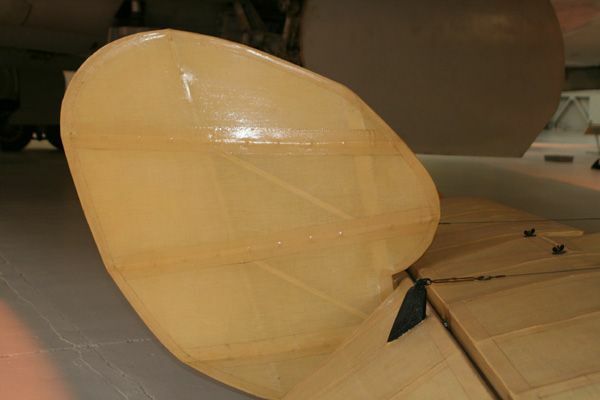 Given that there's no fixed fin on the Cygnet, I've made the all-flying rudder quite substantial, in that in the event of a nose-over, it'll have to take the brunt of the shock as the model somersaults. 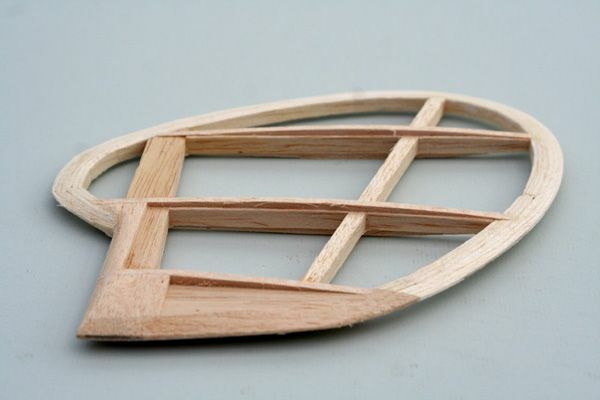 So we have a core of 1/4" balsa, with additional external stringers. All will be sanded to an aerofoil section later. Hi Tim nice to see the build has started. 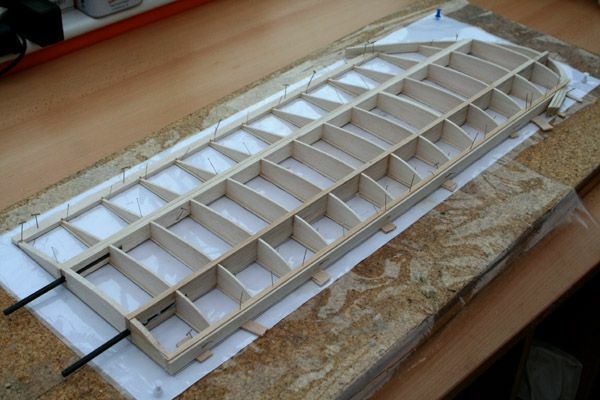 What is the thickness of the laminate balsa 2mm?? 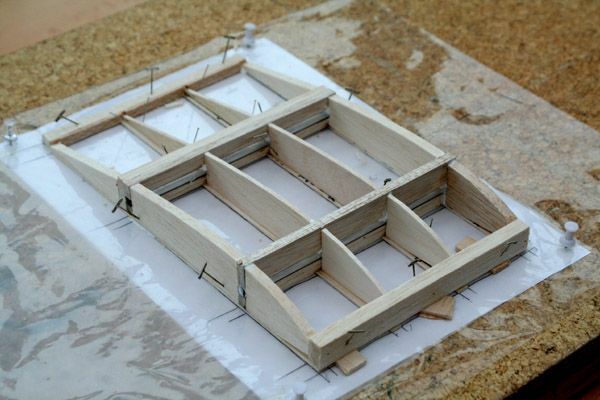 , looks solid to me why not using pieces of sheet. Is there no cad drawing to start with and do you send in the drawing made with pencil and RCME makes a cad drawing. Another one! Does this man never sleep? When you say the balsa is pre-soaked, is this just water or some other chemical that softens the fibres? I really enjoy these threads of yours tim. keep up the great effort. 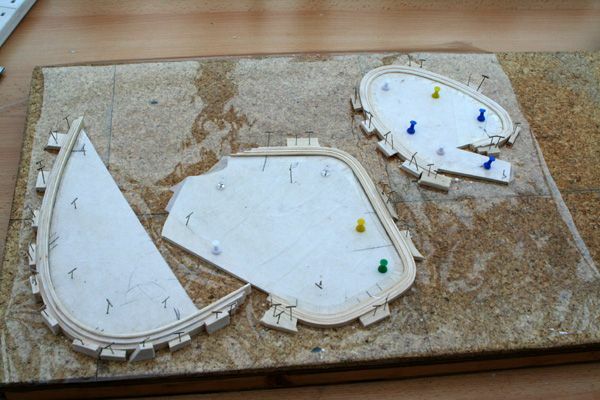 I love the laminated balsa outlines, they look much better and are far stronger than the usual bits of sheet. May take a little longer due to having to cut out the former then wait for drying time but worth it in the end. 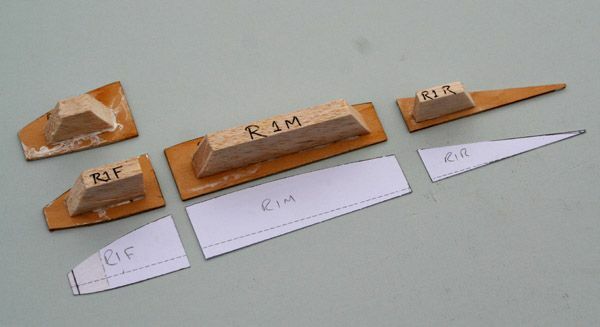 Ton, the balsa I use for the laminations is 1/16th inch sheet. That's 1.5mm to the rest of the world! 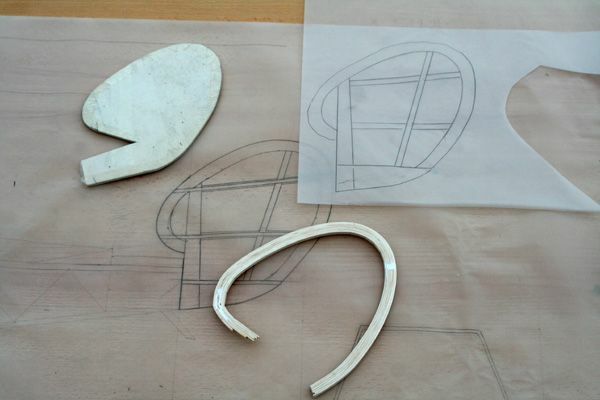 Yes, I draw it all with a pencil, send it to RCM+E, and they scan it into a CAD program. Wolfie, the balsa is dipped into hot water for a few minutes. Simple as that. It becomes quite malleable as a result. Each lamination gets a squirt of PVA glue beofre being bent around the foamboard and left to dry for a day or two. 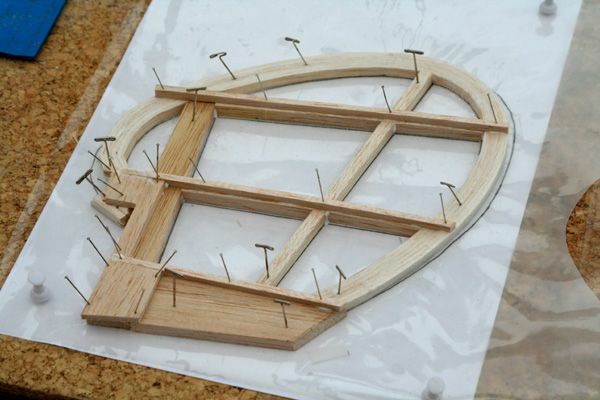 Here's the rudder, now sanded to a rough aerofoil section. It's light, strong and rigid. The tailplane is basically the same. A /4 core, with 1/8 falsa ribs top and bottom. Wolfie, the balsa is dipped into hot water for a few minutes. Simple as that. It becomes quite malleable as a result. Thanks for the explanation Tim. I need to roll a new exhaust tube for a earlier model that has split. Sounds like this might be the way to go. It's details like the laminated curved edges that give models like this an air of authentic charm. I think I would be reluctant to cover it. Maybe a better wing loading? Having seen the Shuttleworth replica perform very ably, I'm going to install enough umph to make some basic aerobatics part of its repertoire! 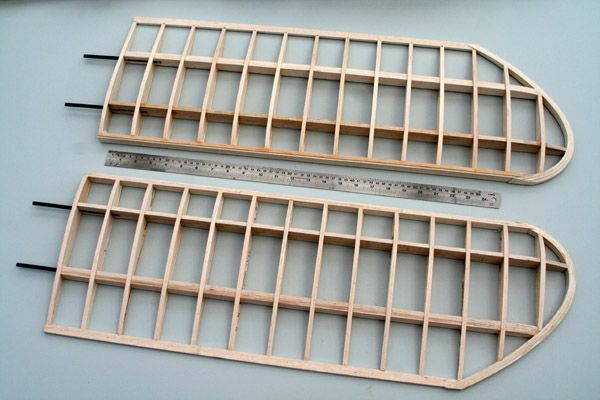 Right, the purchase of some balsa means that I've been able to start on one of the wings - the upper left panel, to be precise. 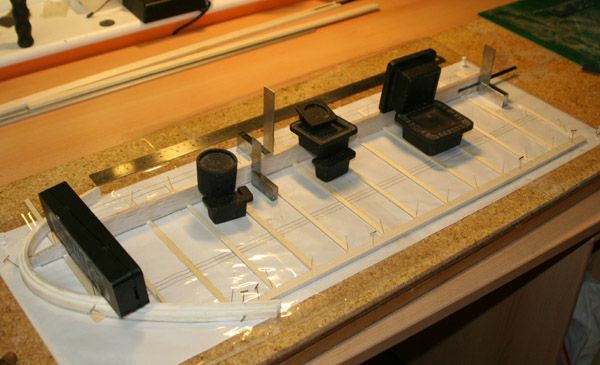 Having no sheeted areas (and therefore no D-box), I'm relying on a hefty full-depth spar to take most of the static loads (although flying wires will be added later), cut from 'weapons grade' 1/4 balsa. .....prior to the chunky mainspar. Note the 6mm CF joiner. 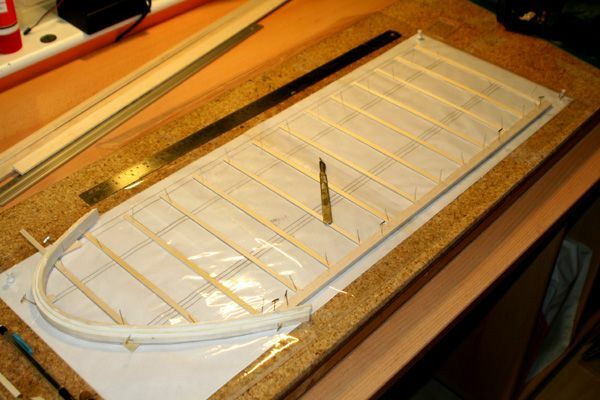 The LE and rear spar (with aileron LE clamped alongside) follow suit. 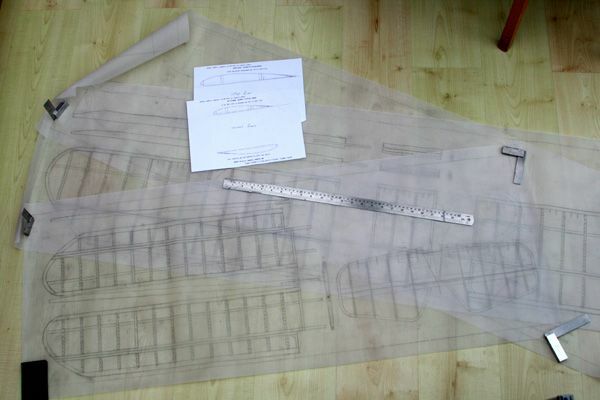 I've cut the templates for the ribs and riblets from 1/16 ply. in a few too many kits! Now I need to sort out the tapered tips, add the upper capstrips, shape the LE, then sort out the myriad riblets! 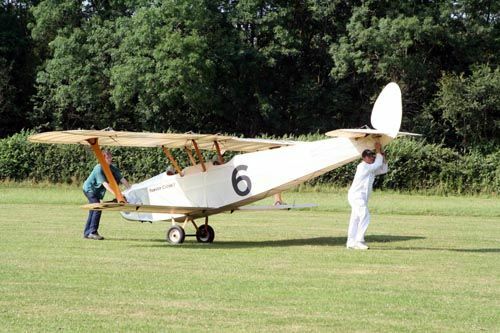 I've been contacted by the owner/builder of the Cygnet replica G-EBJI, Colin Essex, with a link to his website that documents the 17-year build of this wonderful, scratchbuilt aeroplane. Turns out he's an aeromodeller too! I've spent the weekend building the second outboard panel, and then this morning I got them on the bench to help set up the centre-section. The upper wing has no dihedral, and spans around 67". More structure added to the centre-section. Just needs the spars sanding to height before adding the capstrips and riblets. I'll work out the cabane mounts later on. ......and here's some of them CA'd in place! Really nice work any more progress would love to see some more pics. 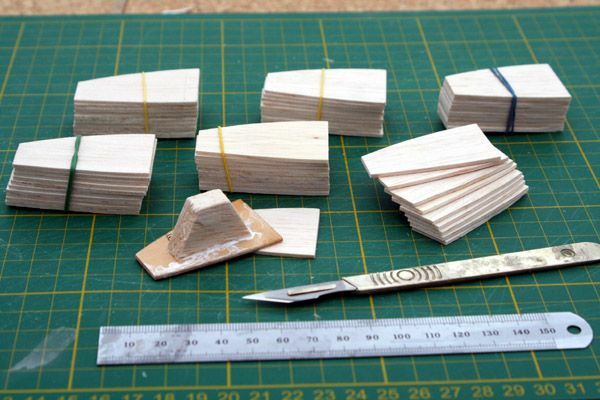 Don't know if your doing it already but I normaly stick some sandpaper on the templates so it does not slide away from the wood when cutting the parts.